They nest in the base of hollow trees, old silos, abandoned buildings and other cavities, hidden away from human activity. If disturbed, they protect themselves by throwing up messy slurry of partially digested food. They consume dead, decomposing things and their eating habits are best described with two words: very messy. Despite their foul eating habits, Turkey Vultures (Cathartes aura) are true masters of the sky when it comes to riding the thermals and graceful soaring. “Poetry in Motion” is the perfect description of their flight. 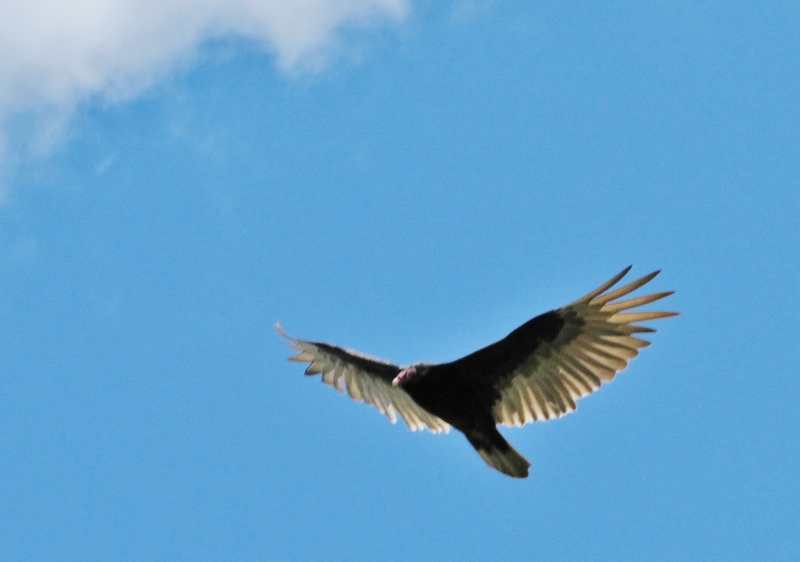 The flight of the Turkey Vulture is distinctive and recognizable from far away. Their wings are held in a slight dihedral (V -shape) and at times they teeter back and forth as they soar and descend in gentle loops and spirals. Wing flaps are few and far between as the sun shines and they ride the thermal lifts. This extra lift comes from the heat over large areas of pavement that have been warmed by the sun’s rays. They are often seen soaring above I-75 in the morning or late afternoon, when heat rising from the pavement, adjacent malls and large parking areas gives added lift. 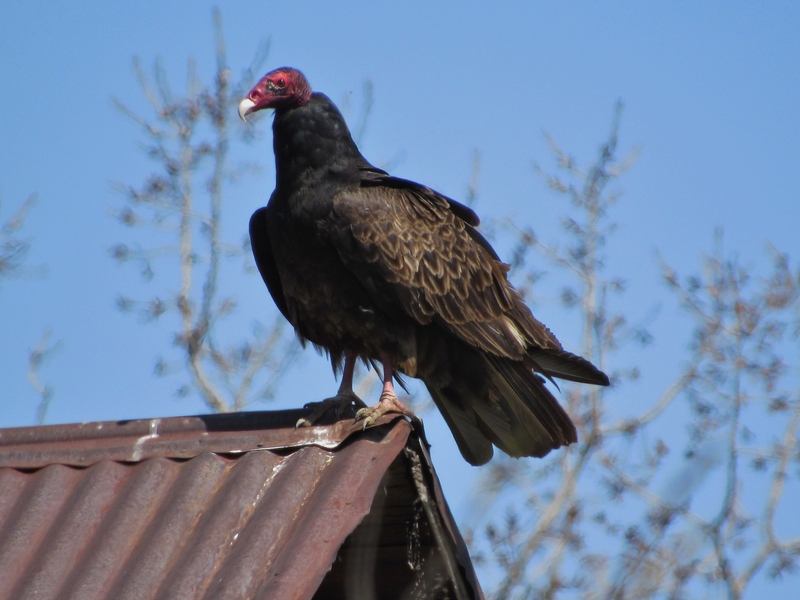 Turkey Vultures have a keen sense of smell that enables them to locate carcasses from afar; they quickly get to work cleaning up the edges of countryside roads. 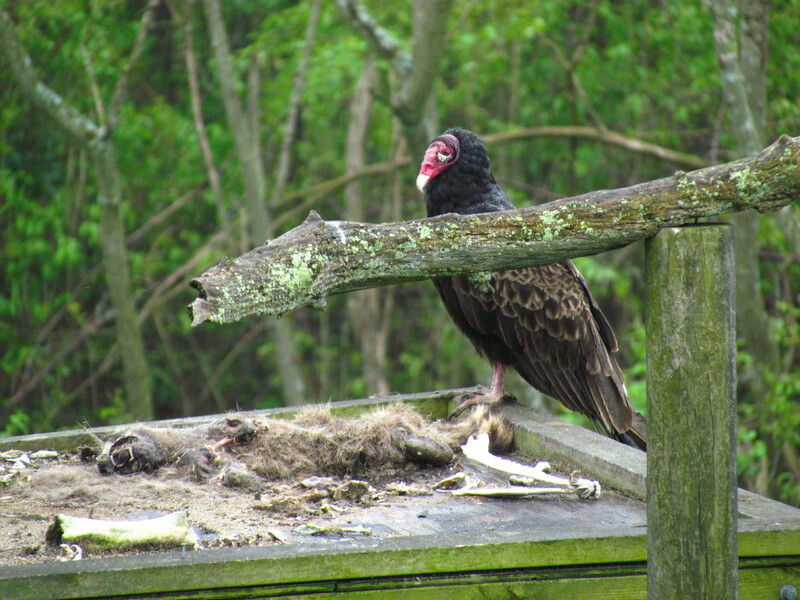 Rancid raccoon, putrid possum, squished squirrel and road-killed woodchuck and rabbits are delicious delicacies for Turkey Vultures of Oakland County. At times, they’ll even peck away at snakes and turtles that did not make it across the road. If a dead deer is located, it’s time for a family feast. Interestingly, they are also attracted to the smell of mercaptan, an odorant added to natural gas. If a significant leak is present or a line ruptures with a whoosh of rising gas, vultures quickly gather and soar and circle overhead. When dinner is detected, the vultures descend to earth and walk around the entrée to select the best place to begin their meal, often the softest, most open section of the creature. If the animal is freshly dead, they may wait a few days for it to ripen to their liking. Vultures have no feathers on their heads, which works out perfectly for their messy eating style. Their heads appear to be jammed into their bodies and their strong, hooked beaks are used to tear out hunks of soft meat. 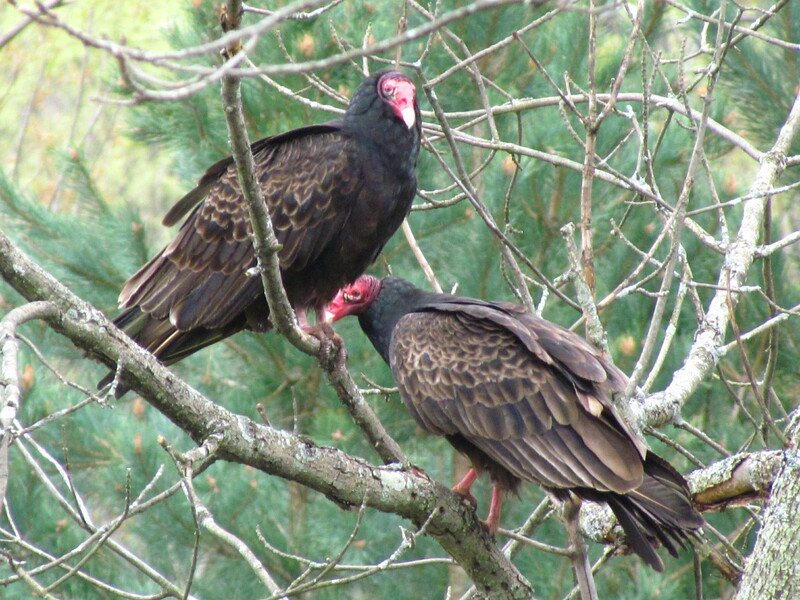 Turkey vultures have excellent immune systems and are unaffected by their diet, making them nature’s best sanitation experts. 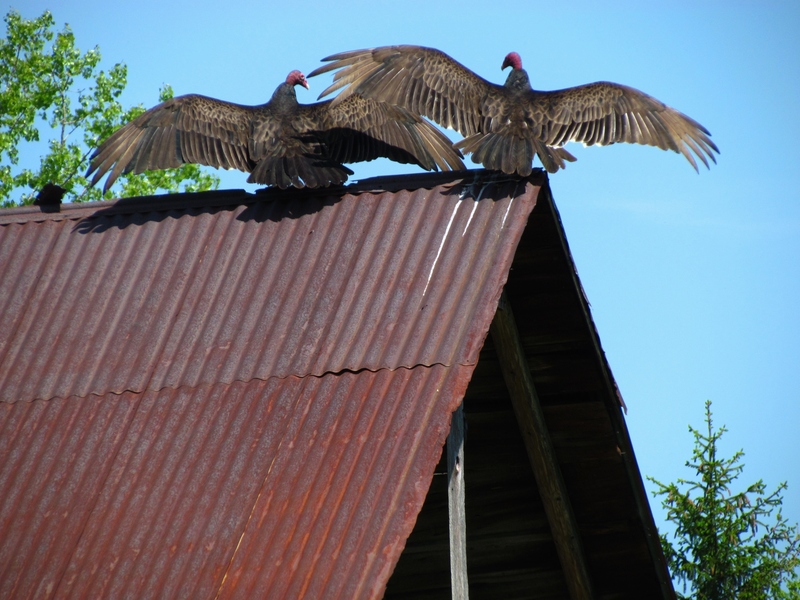 Vultures spread wings to catch the sun’s warmth on a Brandon Twp. barn. After a day of soaring and feasting they return to their roosts. Sometimes you’ll see them high up on ledges of buildings, but more often than not, in trees near fields or on the rooftops of old barns. At first light, it’s time to stretch wings wide and capture the heat of the morning sun before liftoff for a new day of sky patrol. Visit DestinationOakland.com for details on all 13 county parks, including spring programs and trail info. Turkey vultures are so cool. I love to see them soaring in the sky. I took two photos of a turkey vulture near dixie highway and walton rd monday evening 8/10/2015. It was eating a dead rabbit torn a part.. I didn’t know they were that many in this area? Living in Lake Orion, every late August and September they start their flight in mid afternoon, when the air is rising up from the heat of the day. They will sore to heights where they are just a spec while others tend to fly low circling around and around, as many as 50 can be seen above our village. I have taken many pictures to show friends and family that we have them in our area. I have been told that they roost in the Bald Mountain State Land north east of Lake Orion.